Akiza is able to materialize Duel Monsters as reality and the effects of her Spell and Trap Cards are real too. These elements combined liken any duel in which Akiza participates to a Shadow Game. Akiza appears to be extremely unstable, or at least very violent. Due to her mysterious powers, she is called a “witch” and a “freak” several times. These occurrences only serve to separate her even further from the rest of humanity and help fuel her special ability. This is further proven when she is shown to take the persona of the “Black Rose Witch” (simply “The Black Rose” in the English version) so as to intimidate her dueling opponents. Clad in a dark hood and pale mask, the Black Rose is an urban legend in Neo Domino City, feared and known for exterminating all who challenge her. In her youth, Akiza was a sweet girl who loved her father, Hideo, but because of the nature of his work was unable to spend much time with him. During a friendly duel with Hideo, he receives a call from work, which pushes Akiza and awakens her “Signer” powers. 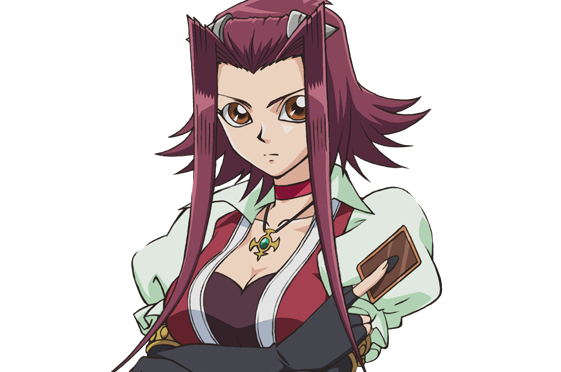 Akiza later attended a Duel Academy as a young teenager, where she inadvertently caused more accidents due to the instability of her special powers. As her classmates and family came to fear her, she became more isolated, and acquired the persona of “The Black Rose”. Akiza was later found by Sayer, a mysterious looking man who had a profound interest in Akiza and her powers. Her first appearance in the series occurred when Leo and Dexter decided to challenge the Black Rose to a duel. “The Black Rose” appeared, and noticed Yusei Fudo and his Dragon’s Birthmark. She sees Yusei as a challenge since she knows he possesses a mark like hers. Akiza is a participant of the Fortune Cup and faces Gill de Randsborg as her first opponent. She wins the Duel with her signature card “Black Rose Dragon” and is then exposed as the feared “Black Rose”, per Lazar’s and Rex Goodwin’s intention. They also wanted Randsborg to expose her as a Signer, however even though she used her powers in the Duel, Zigzix’s D-Tector didn’t receive a reading. Akiza’s next opponent in the Fortune Cup for the second round is the Duel Profiler, Commander Koda, a mysterious man who attempts to confuse and manipulate her with tragic insights from her dark past. After being pushed to her psychological limits by Koda, Akiza loses control as her mark is revealed which makes her more unstable than usual. Akiza is victorious and moves on to the final round where she faces Yusei. After her first attack against Yusei becomes reality, he angrily exclaims that she enjoys inflicting pain on others. With a slightly insane smile, Akiza replies that she is “The Black Rose”, a fearful lady who finds pleasure in other’s pain, but Yusei knows that her hidden emotion is something else. Yusei ends up defeating Akiza in the end. Akiza is then taken away from the scene by Sayer. When the Crimson Dragon appeared in the middle of Yusei’s and Jack’s duel, it showed Akiza, Yusei, Jack, and Luna a vision of the Satellite area being destroyed by a mysterious spider drawing which looks like the spider drawings of the Nazca lines. Before Yusei’s confrontation with Kalin Kessler, his birthmark begins to react inside of the B.A.D area. This triggers Akiza, Luna, and Jack’s birthmarks as well. Akiza instinctively senses that she is responsible for the reaction and knows that it is related to the vision they witnessed during the Fortune Cup. Leo goes in search of her for her aid in fighting the Dark Signers, but he, along with Luna are kidnapped by Sayer. While looking for Sayer, who had gotten involved in a duel against Carly, she encounters Misty, who reveals herself as a Dark Signer. She challenges Akiza to a duel as revenge for her brother Toby, whom she apparently killed. In the middle of their duel, Akiza witness the top floor being destroyed and Sayer falling to his doom, which has shocked her. The effects of his duel had made the building unstable and its collapse prematurely ends their duel. She is found unconscious by Jack and is taken to a hospital. She recovers, but the recent events has caused her to shut off her heart to others. When her parents wish for someone to wake her, Jack recommends that Hideo goes to ask Yusei for help. Yusei agrees tries to reason with her, but Akiza decides to duel him instead. During the duel, her powers go berserk and almost kill her father, but her awakened desire to save him allowed her to control her powers for the first time. She accepts her parents and decides to become friends with Yusei. Later, Mina shows her the true objectives of the Arcadia Movement, experimenting on missing children to form super soldiers. Despite knowing this, she still regards Sayer as an important person in her life. She currently stays at Goodwin’s place along with Yusei, Jack, Luna and Leo. As a Signer, she decides that it is her responsibility to fight the Dark Signer as she tells her parents about these responsibilities. Even though her mother didn’t agree on her ideas, her father approved of it, saying that she would be just fine because Yusei is with her. She has since decided to find and duel Misty again since she guards the Ccarayhua Enerdy control unit. She arrives at an abandoned amusement park, and duels against Misty, projecting herself through a hall of mirrors. Misty shows her the events of the past, about how her younger brother, Toby, was killed by Akiza’s powers, and how the resulting shock drove Misty to her death. Taken aback by all this, Akiza trips and nearly lands on a mirror shard, but is rescued by Sayer, who had survived his attack by Carly. To keep her fighting, Sayer whispers a hypnotic suggestion in Akiza’s ear, taking control of her and unleashing her full power. Akiza summons out her Black Rose Dragon, which destroys all the mirrors and shows Misty’s true location. Meanwhile, Sayer confronts Yusei and reveals he was really the one who killed Toby during his experiments, and used his psychic powers to pin the death on Akiza. However, through Yusei’s manipulation, Misty learns of this and Sayer is eaten by Ccarayhua, freeing Akiza from her trance. The Earthbound Immortal takes over Misty before she can surrender, forcing Akiza to defeat her. She promises to remember both her and Toby. Later during the battle against Goodwin Akiza and Luna defend Yusei, Jack, and Crow by summoning their dragons to protect them from the King of the Underworld. Following the Dark Signer’s defeat, Akiza returns to Duel Academy, along with Leo and Luna. She also learned to have full control of her powers and when she ends up on Yusei’s Duel Runner during a Turbo Duel with Sherry Le Blanc, she begins to have an appreciation for Turbo Dueling, being able to share Yusei’s point of view. Spurred on by this, she applies for and earns a Turbo Duel License by defeating Trudge and is given a Duel Runner by Yusei. Akiza’s psychic ability allows her to make any damage done in a duel to her opponent real. This is the reason why she caused accidents when dueling because she didn’t know how to maintain the power. She wears a hairband to keep these powers under control. During her second duel with Yusei, she was finally able to stop her powers, saving her father’s life. When Leo and Dexter decide to challenge “The Black Rose” to a duel, Akiza first sees Yusei Fudo and his Dragon’s Birthmark. She expressed surprise to the fact that another individual also possesses such a birthmark. She notes it as a “wretched mark” before she leaves from the scene. After meeting Yusei, Akiza changes her outlook on the world. Since they haven’t had a chance to talk, she sees Yusei as a challenge since she knows he possesses a mark similar to hers. In the semifinals, her opponent for the round was Commander Koda. Despite Koda pushing her psychological limits, Akiza still claims victory in the duel. Her dragon mark, the front claw, is revealed towards the end of the duel. It is also revealed at that time her Signer Dragon is Black Rose Dragon. In her second duel against Yusei, when her powers threaten her father’s life, she is finally able to control them in order to save him. She occasionally uses her powers to help her allies like when she summoned Rose Tentacles to get Yusei out of an AI-controlled truck by having it attack the back of the said vehicle. 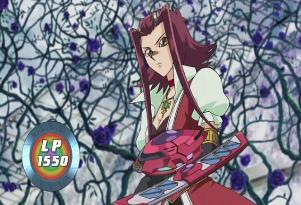 Akiza plays a Plant Deck that is “Black Rose” themed. Her cards consists of gaining control of her opponents’ monsters and inflicting damage by card effects. It is also aimed at summoning her ace card “Black Rose Dragon”, the monster that supposedly led to her alias, “The Black Rose” (“Black Rose Witch” in the Japanese version). In the third season, Akiza finally starts Turbo Dueling, and uses a Duel Runner built by Yusei. Like all Turbo Duelsts, she has a separate deck specifically for that format. At first she has trouble grasping the concept of Turbo Dueling from riding the Runner down to forgetting the concept of Speed Spells but quickly adapts and acquires her license.